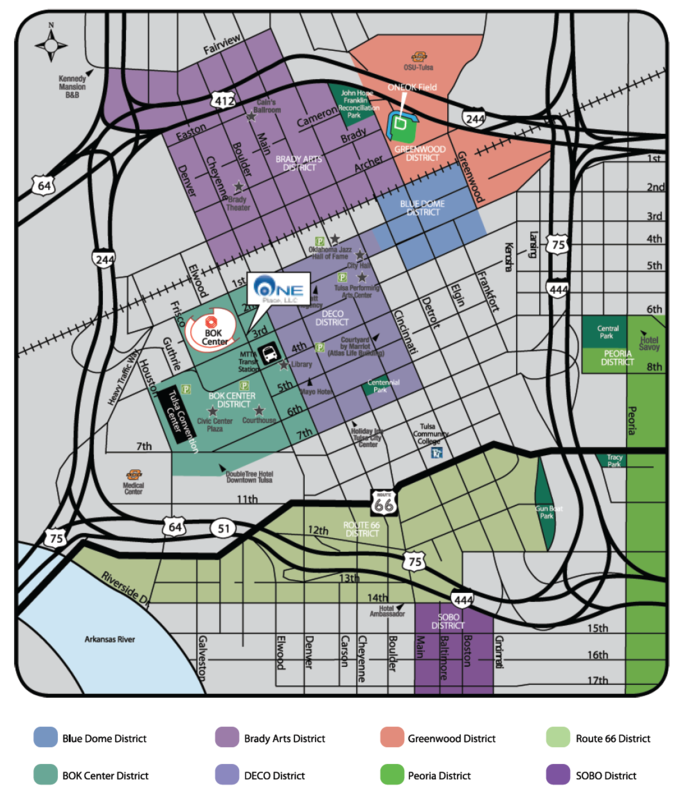 Located in the BOK Center Entertainment District, the $100+ million mixed-use development is at the front door of the iconic, world-class BOK Center. The area features office, residential, hotel, retail and event space. 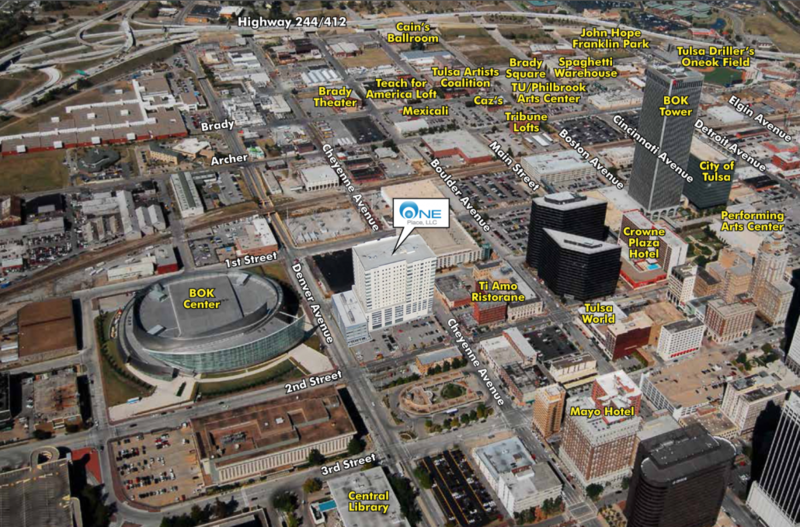 One Place Tower offers a unique tenant opportunity to locate within Downtown Tulsa’s newest and largest private development. 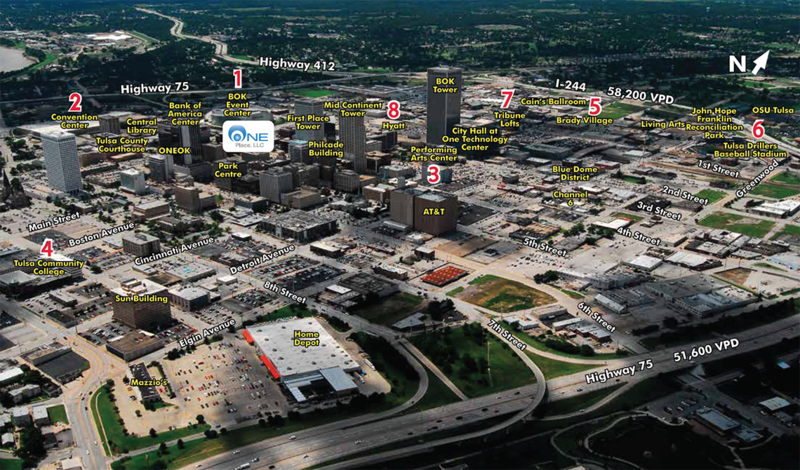 In the past decade nearly $500 million has been invested in downtown Tulsa. The 18,000 residential population within a one mile radius combined with the thousands of visitors that attend the 750+ annual events, the city’s urban core draws consumers from the entire Tulsa MSA and beyond. An additional $350 million is being invested in projects in Downtown Tulsa. These projects include venues for the arts, hotels, office buildings, churches, public spaces, and more. The daytime workforce population is of 35,736 with 1,650+ businesses. Major employers that reside in Downtown include: AEP/Public Serve Company of Oklahoma, AT&T, Bank of Oklahoma Financial, Blue Cross Blue Shield of Oklahoma, ONEOK, Samson Williams, Cimarex Energy and Northwestern Mutual. 731,128+ guests visited The BOK Center in 2011. This arena was completed in September 2008, and quickly found placement among the top arenas in the world. The 550,000 square-foot multi-purpose arena seats 19,199. The arena is home to the WNBA Tulsa Shock and the Tulsa Oilers. It was designed to host major concerts, family shows, ice shows and other world-class entertainment, it averages 177 events per year. 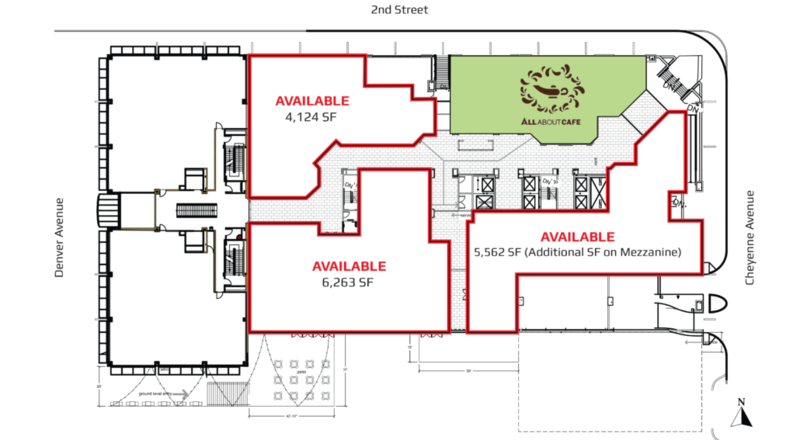 310,625 square feet of meeting space is in place at The Tulsa Convention Center. With an impressive renovation and expansion completed in January 2010, the Tulsa Convention Center has hosted more than 25 million people at over 20,000 events since its opening. 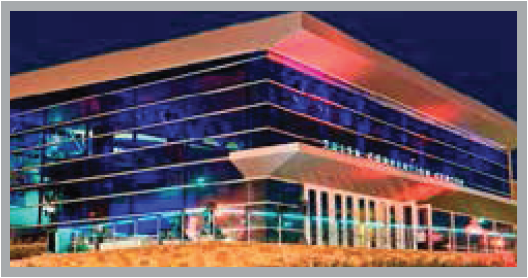 The facility contains Oklahoma’s largest single ballroom with a 102,600 square-foot exhibit hall, 23 meeting rooms, an 8,900-seat arena and executive conference rooms. 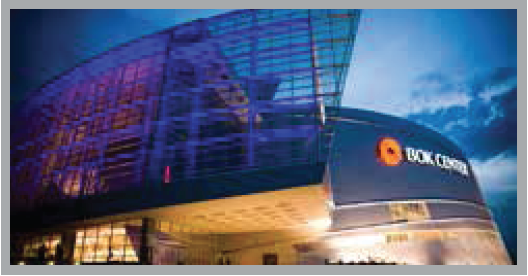 524 performances and $5,028,135 in ticket sales took place in 2011 at the Tulsa Performing Arts Center. This venue houses four theaters, studio space and a large reception hall. The Center’s largest theater is Chapman Music Hall, seating 2,365. Its main entrance is on 3rd Street. The facility’s second largest theatre is the 430-fixed-seat John H. Williams Theatre. Patrons come to the PAC year round to attend a performance from one of Tulsa’s acclaimed arts groups, to sample national and international talent, and to view the PAC’s extensive permanent collection of more than 70 pieces of art. 20,000+ students are enrolled annually at Tulsa Community College’s Metro campus. TCC Metro offers an incredible variety of courses, including computer, health sciences, and international language programs. The Campus is also home to the College’s Nursing and Allied Health Programs, as well as TCC’s Dental Hygiene Clinic. TCC awards three degrees, including Associate in Arts, Associate in Science, and Associate in Applied Science. 2,800-seat Brady Theater is located within walking distance of One Place. This venue was originally constructed in 1914 and renovated in 1930 and 1952. Ranked #26 worldwide for ticket sales at club venues, Cain’s Ballroom is in close proximity to One Place as well. 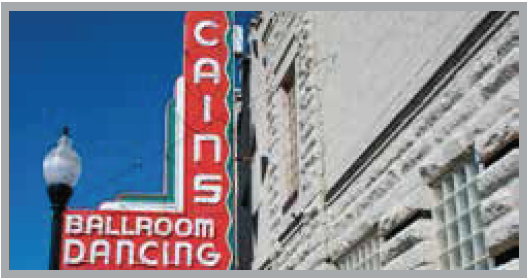 Cain’s is known throughout the music industry as The Home of Bob Wills and the Carnegie Hall of Western Swing. 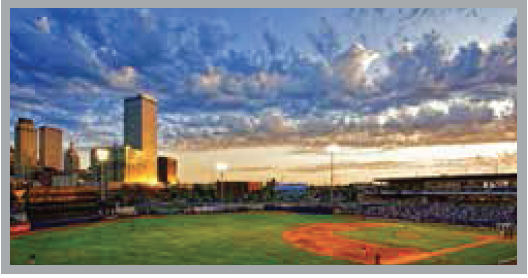 9,500-seat capacity ONEOK Field is located on 8 acres in the historic Greenwood District of downtown Tulsa. It is the home to the Tulsa Drillers, who have over 70 home games scheduled annually. ONEOK Field has hosted an additional 100 non-baseball events since its opening in March of 2010. The Drillers set a Tulsa professional baseball attendance record with 408,183 fans attending games during the inaugural season. They also boast 13 recorded sellouts during the 2010 regular season, equaling 1 of every 5 games. 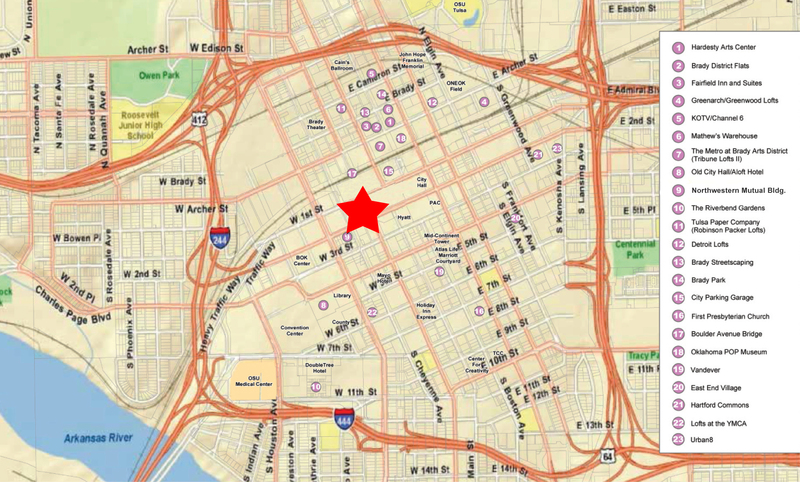 3,995+ people make up the downtown residential population. Currently 1,309 residential units are existing and under construction. Mayo Luxury Lofts, 119 Downtown Lofts, Mayo 420, Philtower Lofts, Tribune Lofts, Detroit Lofts, Renaissance and First Street Lofts have all opened beginning in 2009. The Metro/Brady Lofts II was recently completed, and four additional residential developments are planned. construction at the Fairfield Inn and Suites between Archer & Brady Streets and Aloft Hotel, which will be located in the Old City Hall. Forbes Magazine recently ranked Tulsa in its top 10 for U.S. cities, including: #5 most livable U.S. city, #6 best city for job environment, #7 best city for U.S. income growth and #10 best city in the U.S. for cost of living. Oklahoma ranks No. 1 in the nation in early-childhood education, and the state and Tulsa area public schools are national leaders in the number of board certified teachers. Tulsa is the seat of the University of Tulsa, The University of Oklahoma/Tulsa, Oklahoma State University/Tulsa, Oral Roberts University, Tulsa Community College and Langston University along with several other institutions of higher learning. The BOK Center – 19,199-seat arena houses the WNBA-franchise team, the Tulsa Shock and Double A professional hockey team, the Tulsa Oilers. BOK Center concerts have featured Paul McCartney, Billy Joel/Elton John, Eric Clapton, Tim McGraw, Celine Dion and the Eagles. ONEOK Field – $60-million-ballpark project, which is the home to the Tulsa Drillers, the city’s Double A affiliate of the National League Champion Colorado Rockies. River Parks – Tulsa’s River Parks runs adjacent to the Arkansas River, with more than 26 miles of surfaced recreational (e.g. hiking, biking, and running) trails. Tulsa Museums – Tulsa is home to several unique museums including the Philbrook Museum of Art. Additionally, the Gilcrease Museum is home to the world’s largest collection of American Western art. Performance Arts – The Tulsa Performing Arts Center offers live performances of local productions along with national touring shows. The Tulsa Opera and Tulsa Ballet are both favorites in performance art.